Navigate to the Admin Dashboard → CM Pay Per Posts Pro → Settings. Enable notifications - Check yes or no to enable subscription notifications. Subscriptions notification are sent to the user once he purchase/ subscribe to a post or a group of posts. Emails to notify - Enter email addresses in the provided box that notifications of subscriptions should be sent to. This cover also sending notification to admin or other user who should be notified on new subscriptions. [postname] - WordPress defined post name. 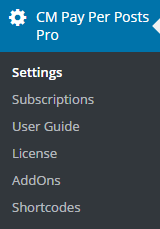 Click on the blue save button to save changes.